One of the greatest running backs in NFL history, Walter Payton's game is best described using his nickname, "Sweetness." His cardboard career is equally impressive, dominated by condition sensitive releases from his playing days and more modern autograph options. 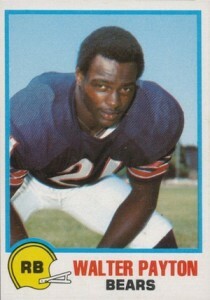 Walter Payton began his Hall of Fame career in 1975 as a first round pick for the Chicago Bears. After a solid rookie season, Payton would be the top running back in the NFL for most of the next decade. His cards also got off to a slower start, with his first main issue coming in 1976. From there, collectors have their pick of various card options up until his retirement in 1987. 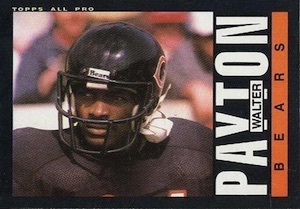 After being featured sporadically in card products throughout the 1990s, Walter Payton was heavily featured in 1999 products. This coincided with his untimely death at just 46 year old. Since then, Payton has been regularly included in products and collectors can normally find him in several insert or base sets each year. 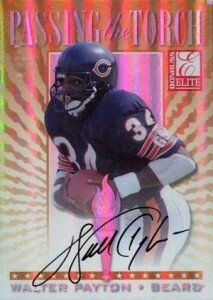 The list below includes ten of the best Walter Payton cards. In terms of value, his rookie card and various autographs are the clear favorites and high grades from most of the releases from his playing days also carry a significant premium. Click on the listing to shop for cards on eBay. The list starts at the very beginning of Walter Payton's hobby existence. Already in his second year when his first card was released, Payton made those that pulled his rookie card very happy by doubling his yardage from the previous year and establishing himself as a star. The fairly generic card carries a wide value range. 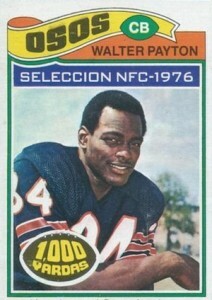 Low grades and ungraded versions of the 1976 Topps Walter Payton rookie card can be found as little as $50. On the other end of the spectrum, a PSA 10 sold for $10,215 in October of 2014. 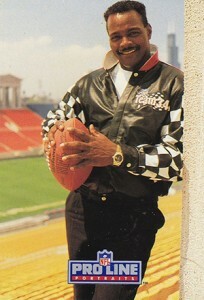 The next major release for Walter Payton came the following year. The 1977 Topps card has a lot more color and personality than Payton's rookie card and honors his 1,000-yard season in 1976. Topps also issued a version that was manufactured and released in Mexico. The checklist and design is virtually identical except for the Spanish text. Although the exact print runs are not known, the Mexican version is much more rare. While his first two releases from Topps showcased his smile in posed shots, 1978 brought a sideline image that is all business. 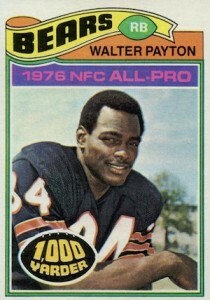 Payton was also included in several other subsets in 1978 Topps Football. Part oddball, part traditional football card, the 1978 Topps Holsum Bread card remains an intriguing item for collectors. 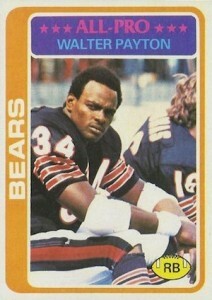 The early Walter Payton card was part of a 33-card set that was found individually in bread loaves. The card has caused confusion given that only Topps is referenced and there is no mention of Holsum. Regardless, this rare card is an appealing option for collectors that are looking for something a little different. Released near the end of his career, 1985 Topps is notorious for condition issues given the black border, so high grades are very tough to find. 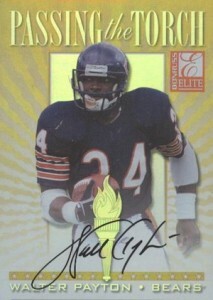 The bold design makes it a collector favorite and the card also has the distinction of being Payton's main release from the 1985 Super Bowl season for the Bears. 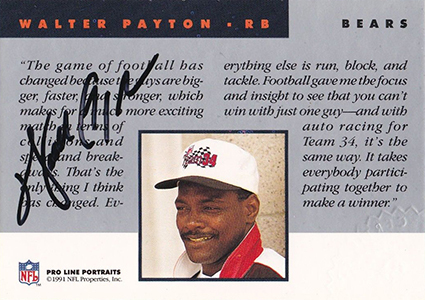 The first pack-pulled autograph for Walter Payton came in 1991 Pro Line Portraits. The bizarre clothing choices and interesting poses have not aged well but autographs will always grab the attention of collectors. As signed cards were still in their infancy, it is more common to find them with the signature on the back. 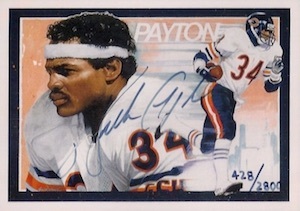 Honoring his impressive career, Upper Deck included a Walter Payton Heroes insert set in 1992 Upper Deck Series 2. The ten-card set was made more desirable with a signed version of the header art card. 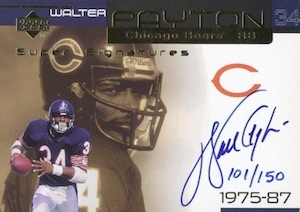 Hand-numbered to 2,800 copies, it is still common to come across them today and they are some of the most budget-friendly autographs for Walter Payton. 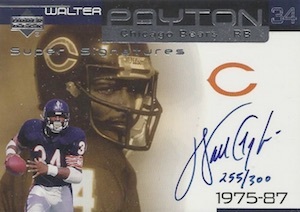 While it was also the year he passed away, 1999 was the best year for Walter Payton autograph collectors as his signed cards were included in many products. 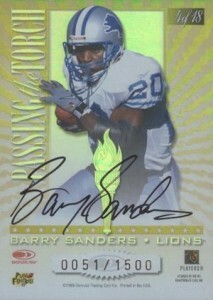 Arguably the most popular option is his Passing the Torch Autograph with Barry Sanders. The card is numbered to 1,500 copies, but only the first 100 were signed and the rest were just an insert. 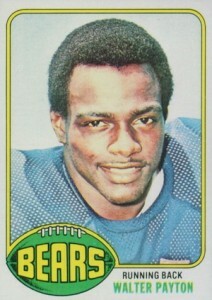 There is also a version that features just Walter Payton. Both cards can be seen below. Part of 1999 Upper Deck Ovation, the Super Signatures set includes a trio of superstars. Walter Payton, Joe Namath and Joe Montana fill the small checklist with on-card autographs and several parallels. The most common is the Silver version, hand numbered to 300. The Gold parallel is limited to 150 and there is also a Rainbow tier that is numbered to ten. The Silver and Gold versions for Payton can be seen below. 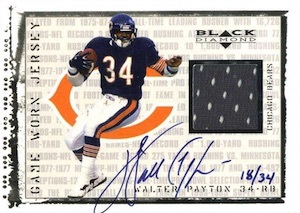 Last but certainly not least, 1999 Upper Deck products also featured a signed card for Walter Payton that included a piece of game-worn jersey. While the cards are numbered to just 34 copies, there are actually multiple variations of the card that were included in several products. The only real difference is the logo for the particular product and a different image of Walter Payton. Collectors can find versions of the card, each numbered to 34, from 1999 Black Diamond, 1999 Century Legends, 1999 Encore, 1999 Ovation, 1999 PowerDeck, 1999 Retro and 1999 SP Authentic. I own the Ovation auto and it is by far the favorite card I own. Sweetness will always be missed!